I thought it would be fun to post links to some fun pet (and not pet) related things I have been reading or working on lately. Check out as many as you have time for. Add your own favorites in the comment section if you would like. My Favorite Things seem very random when I write them out like this, but they make sense in my head! Artists for Hope You may remember me talking about this wonderful group here and in the Wuzzy Chronicles. They just returned from another trip to Cazale, Haiti to visit the children and staff of The Real Hope for Haiti Rescue Center, and to continue their work with local Haitian artists. Thank you Artists for Hope for the kind mention on your website! A veterinary blog and an artist/children’s welfare blog may seem like an odd combination, but in Real Life, it is a very natural fit! Generation Vet has a thirteenth episode out. I am still not over the fun of a veterinary comic strip. It may seem strange to be such good friends with an imaginary veterinarian, but I LOVE Dr. Amanda Brown! My Cat – My article on Omaha.net about Max the Cat is up. He is THE best cat in the world. If you and I are “real life” friends, you have probably met him, but if you have not, meet him here. Next up on Omaha.net will be an article about dealing with pet loss. As you know, I prefer writing about happy topics, but covering this subject is long overdue for me. I think I have done it in a way that will be more helpful than depressing. You will have to let me know when it comes out in a week or two. Thank you Mom-Karen for the gentle nudging to address pet loss and grief. Being a Vet – I spent all last week at work (usually I work one day a week) and just loved it. Wonderful staff, wonderful clients, wonderful patients. This week I am back on Mom Duty (Haha, get it? We are never off Mom Duty!) and have more time for writing. And time for feeding Fuzzy Rat, who is still having vestibular (balance) issues. I appreciate my pets providing me an endless supply of blogging material, but really, boring would be just fine! Petchat and Dogtalk – One last fun link, in case you read this today…petchat and dogtalk are both tonight. If you read this LATER than today, they are every Monday night! Very fun, and I learn so much from other pet lovers. They are both worth checking out! My Small Tipsy Rat – I am going to go mix up some Critical Care and peanut butter, and spend some quality time with Fuzzy Rat. Have a great week! This article was quite a departure from the pet-themed stuff I usually write. But it was really fun to write. And Roberta VanderZwaag is one of my favorite people, so it was a good excuse to spend time with her, and learn more about two things that are very dear to her, art and the children of Haiti. So check it out when you have time. It is in at Omaha.net. I think they didn’t know where else to put it! 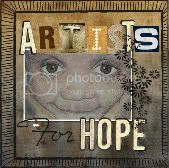 I said Wuzzy Rat would be honored to be associated with such a wonderful group as Artists for Hope! Ever wonder how good nutritional supplements taste to kids? One artist makes a crucial discovery and forms “Artists for Hope” to help combat malnutrition in Haiti. Learn about their work, see pictures of the cutest children you’re ever likely see. And now, fine people, it is time to bid for the auction items. You will love them! Look for the glass bead work. Those are my favorite. $1500 raised for Haiti via International Red Cross Response Fund!